Have a pile of amazing MP4 files to play on widescreen LG TV? But strangely, some MP4 files work and some just don't seem to be playable on LG TV from USB. Your guesses are right! LG TV is refusing to play an MP4 file because of the unsupported codec. Why We Can't play MP4 files on LG TV? What we should pay attention to is that mp4 is a media container format which can be encoded with many different codecs, like divx, xvid, h265, h264, h263, avc, mpeg-4, etc, however, LG TV only supports MP4 with special codecs, and the best format for LG TV is H.264/AVC codec MP4 video (For LG 4K TV is H.265/HEVC codec). In other words, if you transfer MP4 with other types of codecs to LG TV through USB, you will fail to play MP4 to LG TV. How to Solve LG TV Won't Play MP4 through USB? To solve cannot play MP4 on LG TV, you can try renaming the files to see if it helps. If that doesn't help use MediaInfo to compare the video/audio formats inside the container with some file that works. But to make everything easy, one recommended solution is to convert MP4 to LG TV compatible format like Divx, MP4 etc. There are many third-party tools out there that allow you to convert and transcode these MP4 contents for use them with your LG TV through USB. 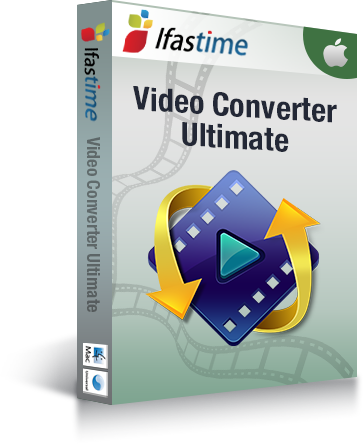 If you are seeking for the best video output quality, fastest video conversion speed, and the most formats supported, iFastime Video Converter Ultimate for Mac will be your best choice. With it, you don't need to know what is the codec in the MP4 format that'll be best for your LG TV. You just need to choose the among the optimized presets for LG TV and this program will do the rest for you. A while later, the video conversion will be finished and you'll be able to watch the awesome media content on LG TV without having to compromise on the quality since this tool is able to deliver unprecedentedly gorgeous visuals while taking unheard-of little time. On the output profile front, apart from H.264/H.265/3D MP4, which is required by LG LED/LCD/4K/3D TV, it has done an unparalleled job by offering other formats like M3U8, AVI, MPEG, FLV, MOV,---the list could just goes on and on and on. What's more, you can split a large MP4 file into several clips easily or extract selected segments of your MP4 file to new files without re-encoding. If you are Windows users, please turn to iFastime Video Converter Ultimate. Just download, install and launch this great LG TV video converter and then follow the tutorial to watch MP4 file on your LG TV through USB smoothly. Free download the professional MP4 to LG TV Video Converter, install and run it. Start MP4 to LG TV converter and drag .mp4 files to the software interface to import the file. It supports batch conversion. 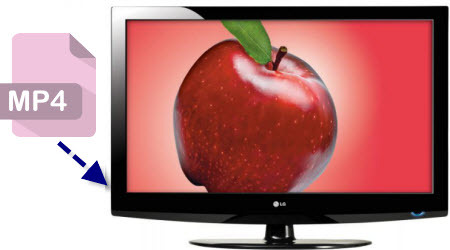 Click Format bar and choose "LG TV (*.mp4)" from "TVS", which can be recognized by LG TV perfectly. To play videos directly from a USB flash drive connected to a USB port on a LED TV, the video should be in DivX HD format. Depending on the model, the TV may support DivX 3, 4, 5 and 6. It also supports AC3 Dolby Digital files, EAC3, HE-AAC, MPEG, PCM and DTS. And choose 3D MP4 for LG 3D TV and HD H.265 MP4 for LG Ultra HD 4K TV. 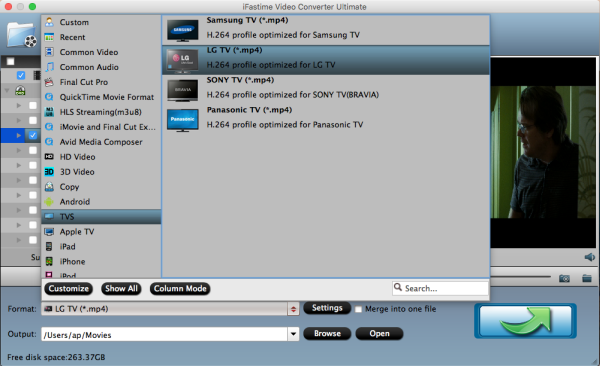 Edit MP4 video for Samsung TV: Click "Edit selected task" to open the Video Edit window to achieve editing MP4 like trim, crop, rotate, add image/video watermark, effect, subtitles, etc in the corresponding editing pane. 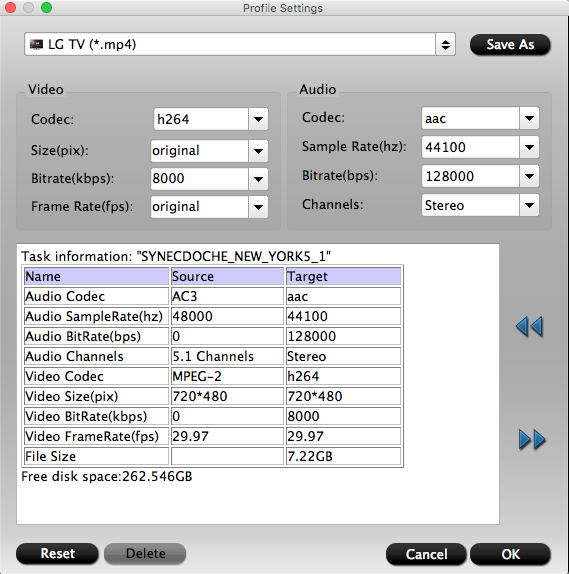 Convert MP4 to a LG TV supported format by clicking the "Start conversion" button at the bottom-right corner of the main window. This MP4 to LG TV Converter is highly efficient and it will finish the video conversion in minutes. After conversion, click "Open" to get the converted videos. Now you can connect to USB 2.0 port and transfer converted video files to USB memory stick or a digital device. Which format is the best for LG Smart TV from USB 2.0? I think all the LG Smart USB interface is 2.0. USB 2.0 or USB 3.0 can read many formats, but it can't read all formats. How to Connect to USB 2.0 port? P.S. Addition to adding videos to LG TV via USB, but you can also stream MP4 files to your LG TV as long as it has DLNA support. If not, it's okay if you have a streaming device like Chromecast, Roku, Xbox or PS3. My sister lives next door and has a new LG smart TV. I discovered that all MP4 files are not made the same! The LG TV wouldn't play MP4 files produced with Power Director (PD11). All it shows is a thumbnail with a question mark. Is there any way to change MP4 from PD11 for LG TV playback? In my LG 55UB085T, most of the mp4 videos not working. Its says Unrecognizable File format. However same files works on other old tv and players. Why my LG TV can't play MP4? If any MP4 converter could properly transcode a Uscene aquarium *.mp4 4KTV video file into a compatible LG TV compatible file? Unfortunately, my LG 4K TV does not read the MP4 from iMovie Theatre transcodes. Any tool lets me convert any MP4 files to best fit my LG TV model UF6800?